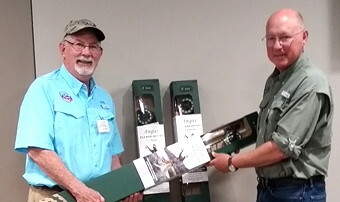 Dave Morse (L) and Mickey McGuire (R) Rocky Mountain Flycasters President Mickey McGuire presents three L.L. Bean Angler II fly fishing outfits to the chapter’s Veterans Service Coordinator, Dave Morse. The rods will be used by chapter volunteers to teach Northern Colorado veterans fly casting and fishing skills. The Platte River Veterans Fly Fishing Program engages veterans to help relieve stress through healthy outdoor activities. Fishing trips, fly tying and rod building activities are also included in the program. Based in Maine, L.L. Bean is a strong global supporter of conservation and has contributed over $10 million to help promote environmental stewardship and access to outdoor recreational opportunities. Recently, the company has also agreed to contribute over $10,000 annually to promote youth fly fishing education in Maine. RMF Veterans Program Coordinator Our TU chapter helps support the Platte Rivers Veterans Program. This is for disabled and former military veterans and active duty members of the military. We hold weekly fly tying and rod making classes all fall, winter, and spring. We have numerous needy vets who lack reels, fly line, boots and waders. So, if you have some serviceable fishing gear that you would like to donate to them, please bring it to the upcoming TU meetings. Contributions are tax deductible and receipts will be given for your donations. Patience - my mentors did not sigh or curse (at least not audibly) when I slapped my line against the water, when I was slow to set the hook on a strike, or when my backcast hooked a branch. I have even hooked one or two of my mentors.They simply went over their instructions again and again. The ability to simplify - Fly fishing is a complex sport. It can bewilder beginners. But good mentors break down complex concepts into simple explanations. One mentor encouraged me to stick with a few simple patterns.Another boiled down my first lesson in casting to: (1) flick your wrist when you cast and (2) keep your eyes on the target. Still another taught me that the foam line in the current is the feed line. Unselfishness - Real mentors sacrifice the time they could be fishing and share the prime spots they could be fishing. They act more like a guide whose mission it is to set up the fly fishers for success. Humility - These mentors are some of the best fly fishers on the planet. But none of them felt the need to inform me about this. I had to coax out of them the stories about their fly fishing heroics. Okay, does this interest you? 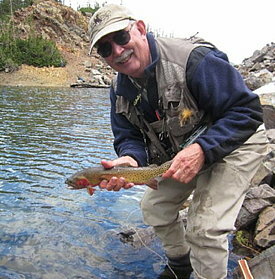 We need one mentor for every two fly fishers for each trip. Can you help? Contact Dave Morse, your RMF Veterans Program Coordinator, for more information or call at 217-418-9386.